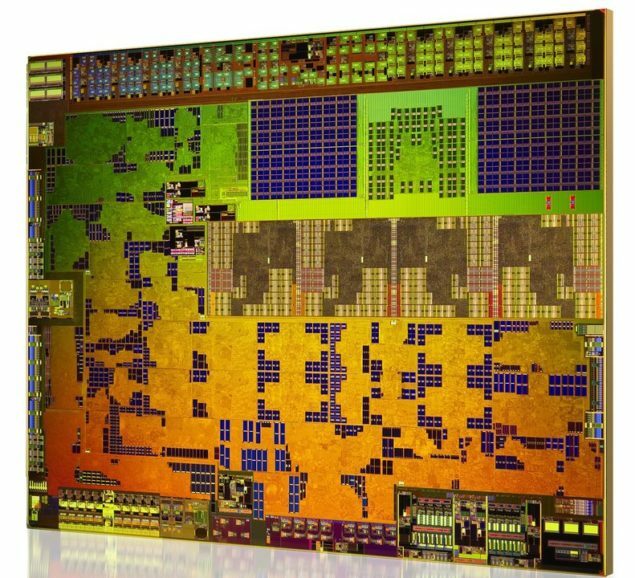 AMD’s next generation Kabini APUs have been released powering next generation of notebooks with the high-performance x86 Jaguar architecture and Radeon HD 8000 cores. 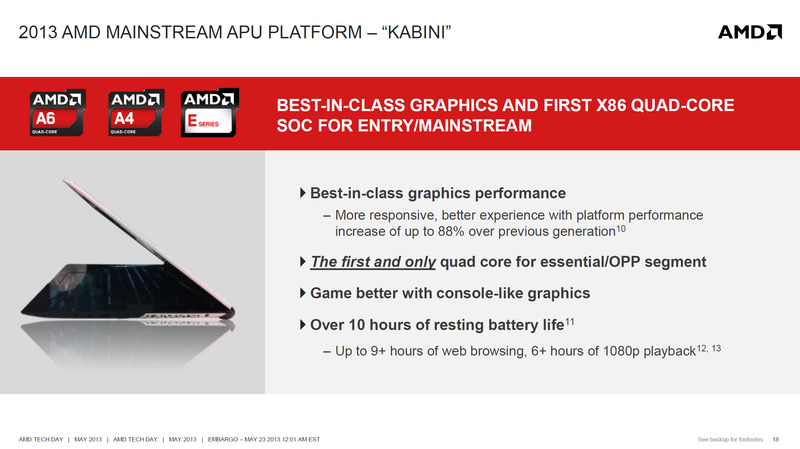 The AMD Kabini APUs or SOC (System-on-chip) is designed specifically to deliver best in class efficiency to next generation mainstream notebooks while delivering faster performance with the first ever x86 Quad Core SOC codenamed “Kabini”. The Kabini APUs feature upto four of the latest x86 Jaguar cores that deliver faster performance over last generation processors while improving power efficiency by delivering muchbetter battery life and performance per watt. 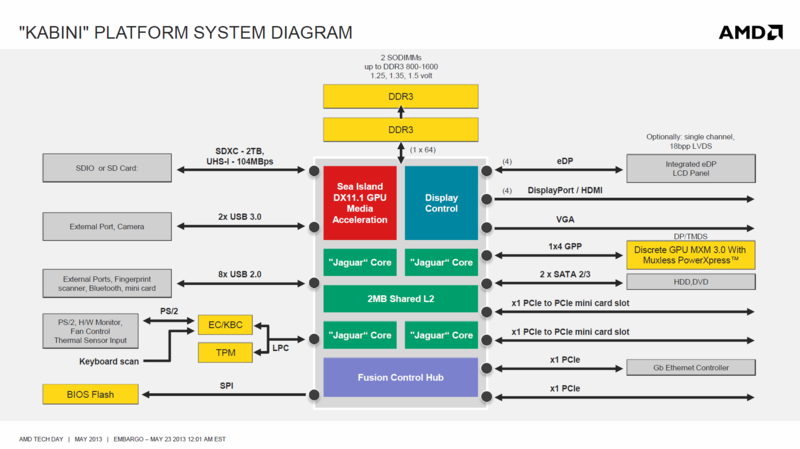 The graphics side of the chip is powered by the latest HD 8000 cores which might not be based on a new architecture but deliver better performance through improved clock speeds. The Kabini APUs are split in two tiers, the Kabini A-Series APUs would directly compete against the Core i3 and Pentium series CPUs from Intel while the Kabini E-Series APUs would go against the Celeron lineup. AMD aims to deliver a new price per performance achievement with their latest Kabini APUs and will be drastically cheaper than what Intel offers. 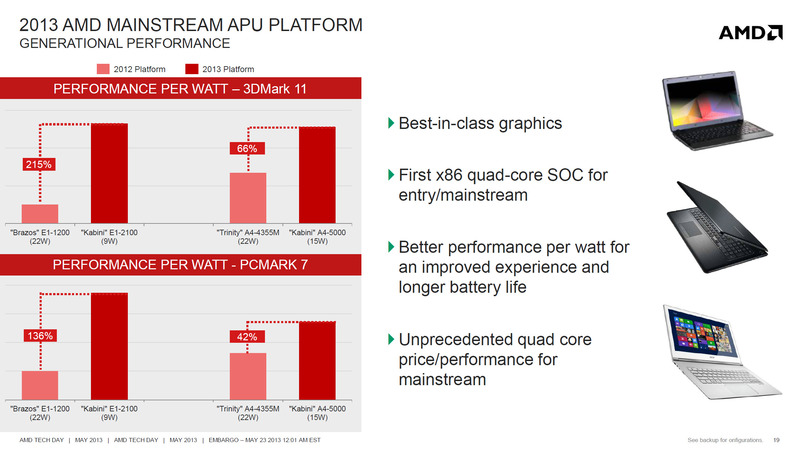 More responsiveness, better experience with platform performance increase of upto 88% over previous generation. 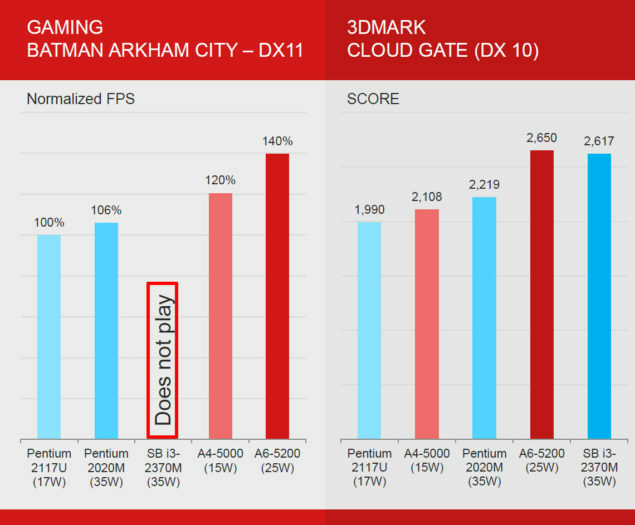 Compared to the Trinity based A4-4355M (22W), the Kabini A4-5000 (15) delivers upto 66% improvement in 3DMark 11 and 42% improvement in PCMark7. On the other hand, the Kabini E1-2100 (9W) is 215% faster in 3DMark 11 and 136% faster in PCMark 7 compared to the 22W Brazos based E1-1200. 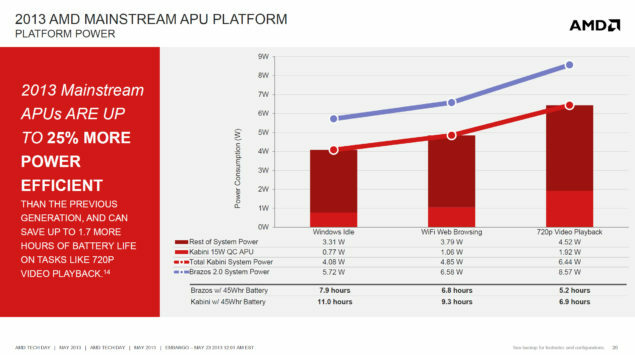 You can check out in the following slide that with Kabini SOCs, AMD aims to deliver upto 25% more power efficiency over Brazos. 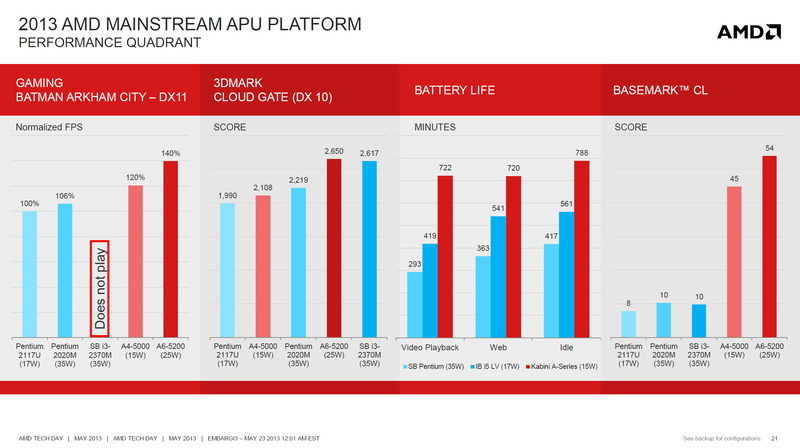 The next chart compares Intel’s Pentium and Sandy Bridge “Core i3” processors with AMD Kabini A-Series APUs. The Core i3 generation CPU can’t run DirectX11 which is available on AMD’s and Pentium processors. AMD takes the lead by delivering 120-140% improvement in Batman Arkham City, faster DX10 performance flagship vs flagship (Core i3-2370M vs A6-5200) in 3DMark Cloud Gate and enhanced OpenCL performance in Basemark CL benchmark. 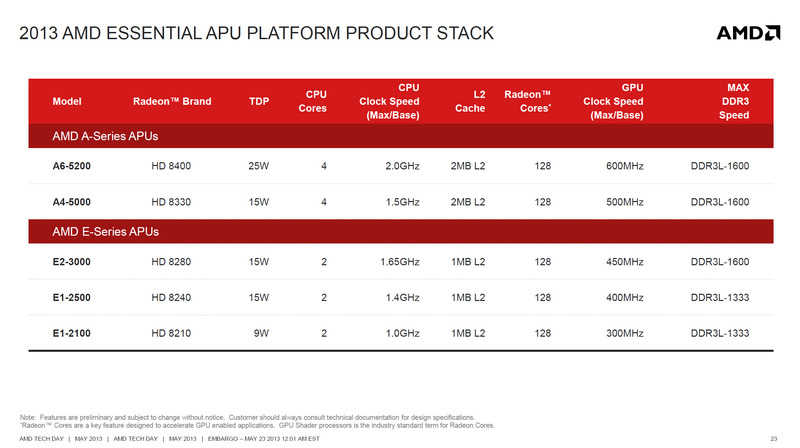 The product stack for AMD’s upcoming Kabini APUs lineup can be seen below. 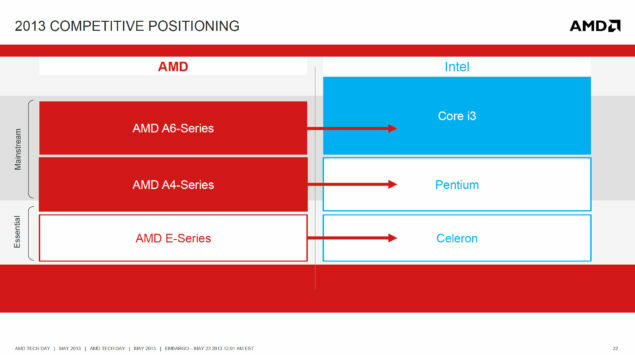 As mentioned on the top, the A-series would be placed against Core i3 and Pentium processors while the E-series would tackle the Celeron lineup. 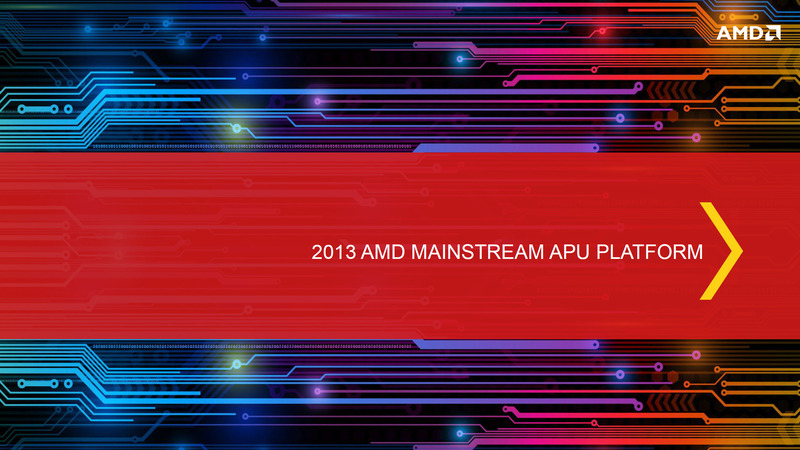 AMD’s Kabini APUs are now shipping globally to OEMs and would be shipped with mainstream notebooks.